Time Displacement / Chemobrionic Garden is an interactive generative chemical sound installation. 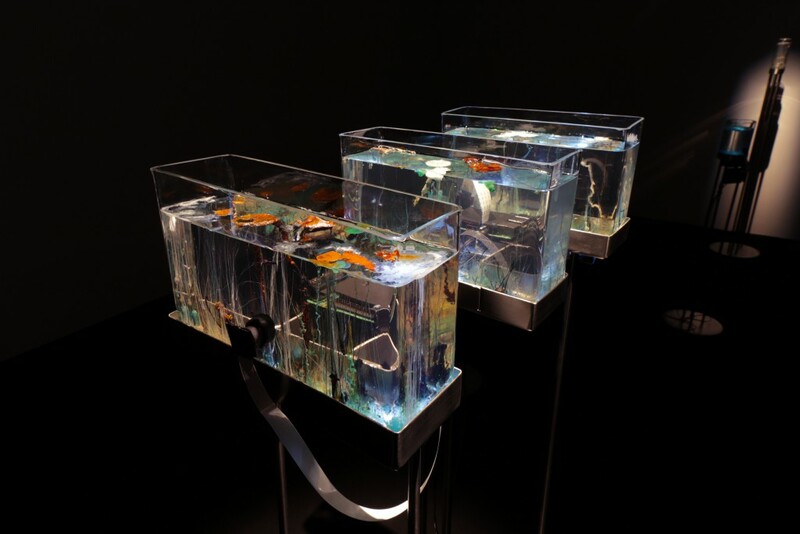 The installation explores a relationship between hydrothermal chemistry, the passage of time, and sensory systems tracing changes outside of the human scale. 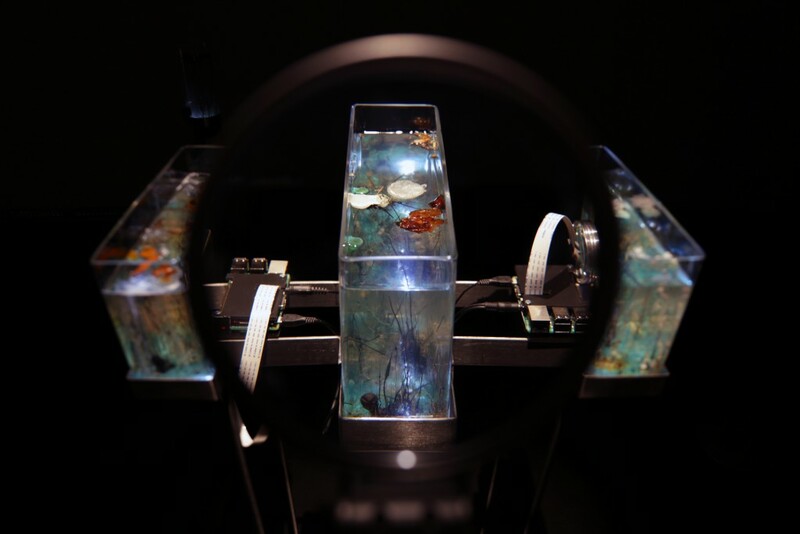 Artists created an installment comprised of several small chemical garden formations in a water glass (sodium metasilicate) solution, to provide an insight into research on the origin of life and on chemical processes. 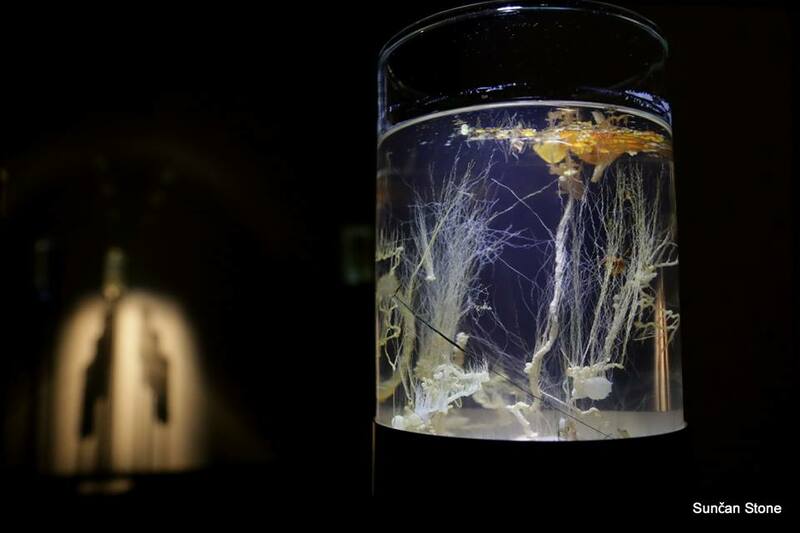 The project’s theoretical background is based on a paper entitled From chemical gardens to chemobrionics, written and issued by a group of 21 distinguished scientists on 29 May 2015, a reiterating call for research into the principles of self-assembling structures, to produce – as they suggest – new insights into the origin of metabolism in Earth’s early geological periods. The chemical reactions are monitored by cameras to detect changes in colour and in shape by means of a microcontrollers. The changes affect the code for live sound generation, and slowly work to alter the generative drone composition pervading the gallery space. It goes beyond the human perception of time. It calls for a perspective that considers multiple dimensions of temporal rhythms in space with slow modulation beyond the spectrum audible to the human ear. The core proposition of this piece is to create a situation in which the growth of chemical structures takes the centre stage. The human expectations are put in the background in order to stimulate a state of altered listening in which one is exposed to the geological passage of time. The antagonism between the human and the Earth’s processes is a direct result of anthropocentric perspective. In the age of anthropocene we need a radical shift in perspective if we are to survive as a species. Scientists are on a new quest to find in these abiotic formations the root of biotic protocells. 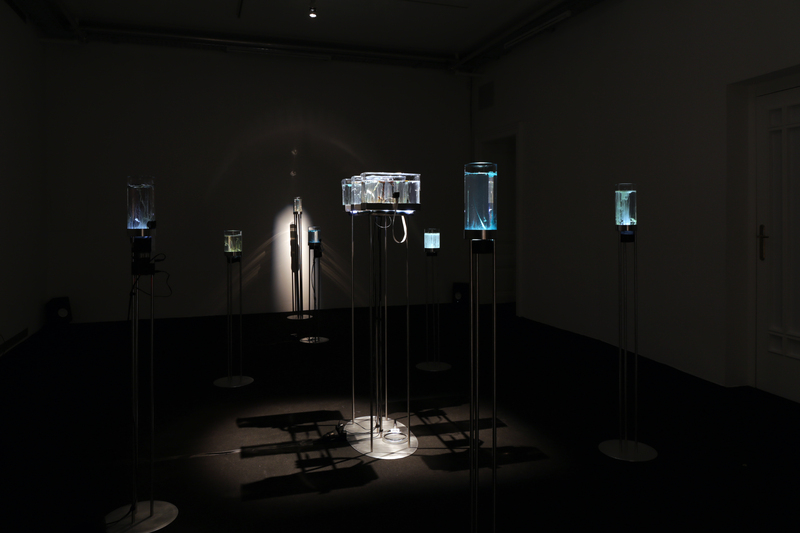 In addition, Time Displacement poses a question of giving way to life by means of shifting ways of sensing. The question of the origin of life inevitably seeks to ask the question of finite nature of life forms themselves. The colourful biomimetic morphologies of chemical gardens are a fascinating imitation of life. In the last few centuries, chemical gardens have progressed from being a counterfeit of biotic life to being the original; from childlike imitations of life to the sheer origin of life on Earth. The colourful biomimetic morphologies of chemical gardens are a fascinating imitation of life. Key to these marvellous structures, which spent decades, locked away in an alchemist’s cabinet of curiosities, is a renewed study of chemobrionics, a field combining chemistry, physics, biology, and materials science. Chemobrionics denotes self-propagation, the growth of chemical structures with a tendency to increase concentration gradients under conditions of osmotic pressure and buoyancy. Scientists are on a new quest to find in these abiotic formations the root of biotic protocells. Therefore, in the last few centuries, chemical gardens have progressed from being a counterfeit of biotic life to being the original; from childlike imitations of life to the sheer origin of life on Earth. 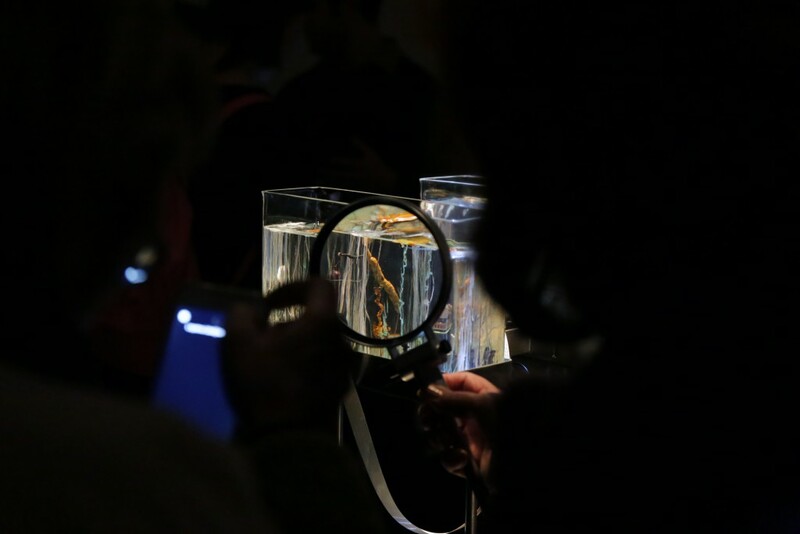 Time Displacement is a durational performance which uses chemical gardens as stained glass pictures to explore the optics that change the cultural perception of the world and the practice of differentiating between organic and inorganic matter. This changed perception of matter is made possible by means of interdisciplinary research, which contributes to a more holistic understanding of (geological, chemical, social, political) processes in the world. Although not a new exploration, chemical gardens are only now emerging as an unexpected research area and a prime example in chemistry of self-organising non-equilibrium processes that create complex structures, combining chemistry, fluid dynamics, and materials science. 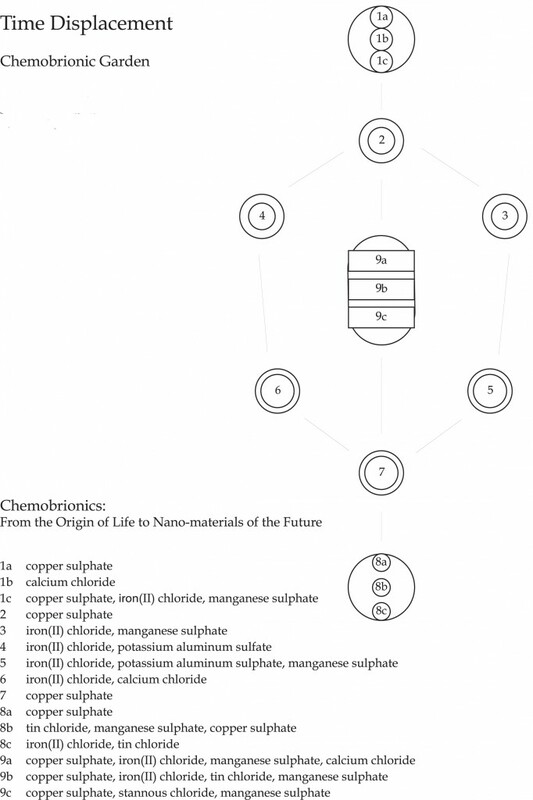 If research in the field of chemobrionics is legitimated by the development of new materials for commercial purposes, Time Displacement encourages such study of materials, which maintains a fascination with the potential development of nanomaterials without any commercial implications. A durational performance in an open laboratory takes the viewpoint of the history of science to talk about findings, which are primarily a product of the cultural environment not just a result of meticulous research. 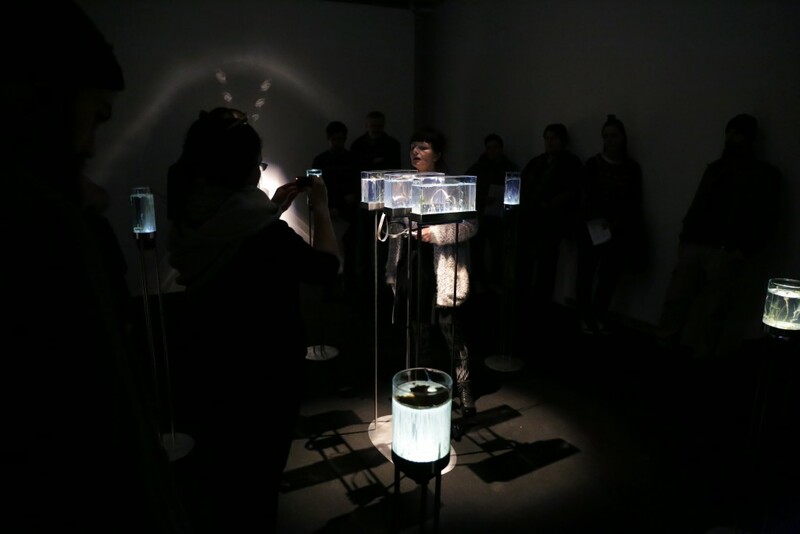 The chemical-acoustic live experiments in the installation are comprised of several small chemical garden formations in a water glass (sodium metasilicate) solution, to provide an insight into research on the origin of life and on chemical processes, which unfold at a pace that is rapid, yet still too slow to be discernible to the naked eye. The chemical reactions, where visible changes take between 8 and 48 hours, are monitored by cameras to detect changes in colour and in shape by means of a microcontroller. The changes affect the code for live sound generation, and slowly work to alter the generative drone composition pervading the gallery space. A sound art installation which goes beyond the human perception of time calls for a perspective that considers the multiple dimensions of temporal rhythms in space. The project Time Displacement / Chemobrionic Garden got a nomination STARTS 2016! It was selected from 1,861 projects into top 30 project of STARTS 2016 award. The history of chemical gardens has always been closely intertwined with experiments juxtaposing the propagation of forms in chemical reactions with biological forms. In the early 19th century, scientific research attempted to prove that biological life had evolved from the inorganic worlds of physics and chemistry: from chemical gardens and osmotic forces, from diffusion and other physical and chemical mechanisms. Scientists’ endeavors in plasmogeny and synthetic biology were refuted when, in the 20th century, genetics established the complexity of hereditary cells by isolating DNA. In the 21st century, on 29 May 2015, a group of 21 distinguished scientists issued a paper entitled From chemical gardens to chemobrionics, reiterating a call for research into the principles of self-assembling structures, to produce– as they suggest – new insights into the origin of metabolism in Earth’s early geological periods. The lecture employed the methods of a botanic garden tour. It was based on From chemical gardens to chemobrionics, a paper from May 2015 which restores the role of chemical gardens at the outset of synthetic biology. The scientists publishing the paper suggested the term chemobrionics, blurring the boundaries between inorganic and organic chemistry, and proposing a number of methods for the study of new materials. In the lecture, the frames of reference for an interpretation of Time Displacement included a criticism of science, an analysis of live-generated visual auditory structures, and science fiction. 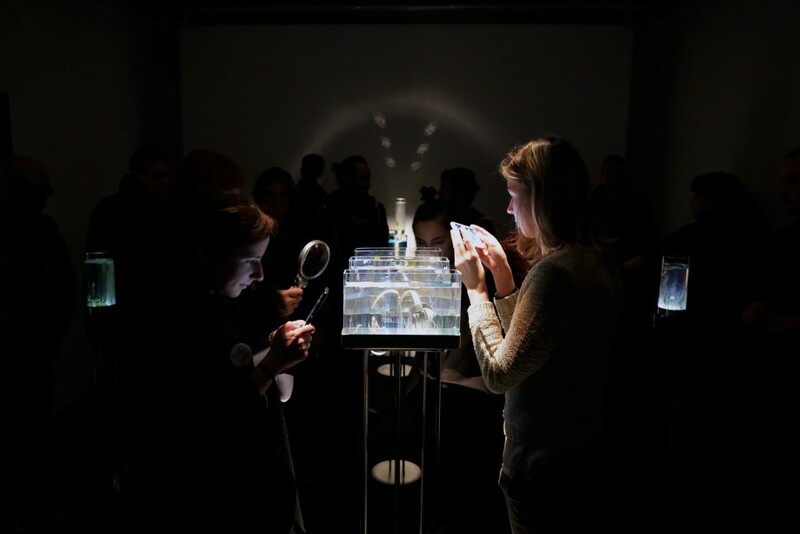 The durational performance in an open laboratory has been designed for the general public and scientists to learn about the principles of osmotic forces and crystal growing procedures. In the laboratory, visitors had been able to conduct an osmosis experiment in a water glass solution, with chemical compounds such as sodium silicate, sodium acetate, calcium chloride, copper(II) sulfate, iron(III) chloride, chromium(II) chloride, iron(II) sulfate, cobalt(II) chloride, potassium aluminum sulfate, manganese(II) chloride, nickel(II) sulfate. The audience also learned about live-generated music with slow modulation beyond the spectrum audible to the human ear. Technical support: Valter Udovičić and Roman B. Project was supported by the Slovene Ministry of Culture and MOL – Department for Culture.